It item is fits for iPhone 5 and iPad Mini. 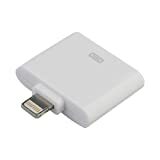 Use this intelligent and ultra compact converter adapter to connect your 30-pin accessories to devices featuring the Lightning 8-pin connector. With it, you don’t need to buy a new Lightning 8 pin cable. Just use your original 30-pin cable works on iPhone 5. It helps you enjoy all functions the original Lightning cable do. On October 14, iPhone 4S was launched. It was a long waited day for the fans of iPhone and they have waited long for availing the best smartphone ever from the Apple store. The lines of millions of people remained outside the local store of Apple with lots of smiles, grins and chattering. But, many news channels have reported groans aroused with iPhone 4S. The latest error highlighted by the news channel and the customers is the unusual battery drain with the iPhone 4S. The battery drains are even happening if the phone remained idle. Many have accused poor reception for this highlighted problem. But, the fact is poor reception is not associated with the unusual battery drain. This problem was associated with the old version of the phone. The new device is installed with dual mode antennae scheme for ensuring the better signals reception in the phone. People have reported that their old version of iPhone 4 has much better battery life than this new version, iPhone 4S. In response to this problem, many iPhone 4S experts have said that it is because of the user errors. They have pointed that the quick drain battery is because of the inappropriate use of the device by the users. Users do not turn off the non essential apps and functions, thus they have to face such problems. After this report from the executive members of Apple, many users have incorporated the change in their usability of the phone. Still the problem of unusual battery drain persists. A member of CLS, Apple support forum has also highlighted that same problem with his iPhone 4S. He said that by using the iPhone 4S for 30 to 45 minutes, he lost 35% of the battery. That was not the case with old iPhone 4. He also added that if this matter exists then he might have to recharge 100% of the battery every night. Apple has heard the voice of iPhone 4S users and they have evidently started working upon the issue. Apple has apologized to the users and they have assured their incredible support for fixing the issue. Some of the users were blaming new dual core CPU for the battery sucking. But, Apple was not thinking the same. According to the views of experts of Apple, iPhone 4S is designed to provide 9 hours Wi-Fi data browsing and approx 8 hours of talk time on 3G network. On the other hand, some of the users have blamed the iOS 5 operating system in the new iPhone 4S as battery drainer. iOS 5 is the main culprit according to the theory presented by Apple, as well. iOS 5 operating system always remain active for polling the location of the device. This is the main reason for battery drain and users have to recharge it so often. Apple is working with its team to sort out the basic problem associated with the iPhone 4S. They will soon figure out the possible solutions for its users. The new iPhone 4S is the example of customerisation which has added congenial colours in the world of mobile devices. It is basically the latest and upgraded version of Apple’s iPhone. Undoubtedly it is almost clear that the prime focus of apple is to penetrate their products into as many number of hands including those who already have iPods. This new launch is mainly focus on price. Unlike previous versions of iPhones, iPhone 4S has overcome various issues and added number of value additions that make it superior and undoubtedly the millennium device. Let’s have a quick review on the features and the specifications of the device. – A5 chip with a Dual core: A5 chip with a Dual core in iPhone 4S make it faster and prompt than other mobile devices. It is 7 times faster than previous versions, make the difference when you launch any app, ply any game or brows on internet. A5 chip with a Dual core also make iPhone 4S energy efficient and enable you to enjoy the lasting battery. – iSight camera: Now capture the world with amazing results. iSight camera includes latest optics with the resolution of eight mega pixels and a custom lens with greater aperture of f/2.4. Along with all these things, iPhone 4S has an improved sensor that enable users to take the picture in the professional style. – Video Recording: Now shooting of high definition videos of one thousand and eight hundred pixels striking are possible with your hand set. Shoot whatever you want. With latest optics and intensity of light, you will get the good results. You can even edit your videos on real time with iPhone 4S. – I Cloud: This simple and automatic feature reduces your job of managing your files, mails, apps, photos, contacts, calendars and other stuff. Let I Cloud to manage your stuff. – Retina Display: The screen with highest ever resolution has given iPhone 4S an edge over other devises. With high density of pixels, you can enjoy the true feel of sharper graphics, texts and pictures. For a long time the mobile market was dominated by a few big hitters, the most major being Nokia. However in 2007 when Apple entered the market and introduced consumers to the idea of the Smartphone, the big hitters were left on the subs bench. These days, however, almost everyone with a mobile has a Smartphone. But Smartphones aren’t phones at all, they’re miniature computers that can make calls and send text messages, and although the touch screen is what initially attracted the public and media attention, the defining feature which sets them in a league of their own, is the ability to include apps. Applications allow users’ mobile phones to be endlessly adaptable; it makes the devices capable of an exponential amount of tasks that attempt to streamline daily issues and make life less stressful. Whether it’s forecasting the weather, finding a restaurant or checking cinema show times, there’s an app for all these things and more. The previous leaders of the mobile market such as Nokia, Samsung and Motorola, had specialised in handset technology, and it was this technology that was the primary feature that continually developed in the industry. But Smartphones knocked all these out of the water because with all the applications Smartphones made handsets totally redundant. Back in the late 90s Nokia was Europe’s most valuable company, however in 2008 it was reported that the company’s market value had shrunk from 203 Billion Euros (in ’99) to 29 Billion Euros. The Finnish developer was late to the Smartphone party and although it soon introduced Smartphones into its range of devices, the consumers were completely unfamiliar with Nokia as a Smartphone developer so the major issue was, why would consumers chose to purchase a Nokia handset over an iPhone? This was the Apple effect and it revolutionised mobile technology forever. Nokia have been playing catch-up for a long time, and to be fair, they haven’t done a bad job. With several efficient and stylish models on the market, like the Lumia 800, the 808 PureView and the N8, Nokia are dominating the Windows Phone sector. Since January this year Nokia’s share of the Windows Phone market propelled from a meagre 22% to 59% in July. Unfortunately Windows Phone, Microsoft’s new mobile operating system, isn’t proving particularly popular (accounting for only 3.5% of all Smarphones shipped) and so this needs to expand significantly before Nokia can really feel the benefit of leading the charge in this specific market. Apple stayed ahead of the curve by changing the game entirely. They made mobile technology evolve, pushing the very idea of what a mobile could be. By creating what are essentially portable computers they made mobile phones capable of so much than just phone calls and text messages. The mobile market is a continually shifting sphere, but it’s safe to say that thanks to Apple, apps are here to stay. Unfortunately for Nokia they may have realised this a little too late to ever enjoy their Halcyon days of the 90s again. This article was written by Barry Cooke. Barry is a respected mobile usability consultant who has been working in the mobile market for over 15 years in a number of different sectors from online dating apps to finance and travel. Spotify has become a powerful service in the music industry. To prove this, a music streaming company released some figures earlier this month. According to this company there are about 20 million people availing the services of Spotify and about 5 million of these people pay a monthly fee. About one million of these users are from U.S. The service is growing very fast as one million of the paying users joined Spotify in the previous year.An event was organized jointly in London and New York to reveal the new developments of this fastest growing company. The company has got about 1 billion playlists. The company has made many efforts to make this a mainstream company for streaming of music. Daniel Ek said that their mission is to make the music available to every single man on this planet. The company is trying hard to build a service that lasts for a longer time. He further said that about 70 percent of the gains from the service is paid to the rights holders. The company has paid more than half a billion dollars and since the last 9 months this rate has increased. He said that the company is generating benefits for the whole system out there. The payment rates by the company also attracted Metallica. Metallica has out their whole catalogue on Spotify. This is the same band which sued Napster. The question that why T-mobile does not offer iPhone was always wandering in people’s mind. But now the company T-mobile announced earlier this month that they will be working with Apple. The agreement has been signed with the iPhone maker. According to this agreement both the companies together will bring products to the market in the year 2013. In a press conference, the CEO of T-mobile named Rene Obermann has confirmed this news. Apple and T-mobile has not given any further information regarding the specifics of this agreement. The agreement might be similar to the agreements that Apple have made with other carriers which include selling either iPad or iPhone or both of them. T-mobile will now offer 3G speeds for its iPhone customers in some metropolitan cities like New York. In the next year, the company will launch an LTE network that will be compatible for iPhone 5.We are in contact with the T-mobile to gather some more information regarding this agreement and their plans and we will convey you more about this news as soon as we get any update. Update 1: T-mobile said in the release that they have entered in an agreement with Apple and from next year they will bring products in the market. Further details will be available later. Update 2: Apple has also confirmed this news of agreement between them and T-mobile. T-mobile will offer some of the Apple’s product but it is still not known that which products will be available through T-mobile. The above screenshot claiming to represent iOS 8 just showed up on a Weibo account. Even though the source of the images is absolutely uncertain, I have confirmed with several sources that these shots are legitimate. Earlier today, I detailed the new Preview and TextEdit apps shown above, and I previously discussed Healthbook. I’ll have more news on Healthbook in the coming weeks. Until then, you can check out a higher-resolution mockup of the Healthbook icon below. I’m not sure what the Tips icon is for, but it is probably a user-guide of some sort. Of course, it’s plausible that the icons are works in progress. Read the full story and see all screenshots at 9to5 Mac.